It is bad enough that the government allows multinational companies to privatize a public resource, it is even worse that taxpayers are being hosed by charging so little for it. Several industries get a total free ride when it comes to taking our water. Those who do pay for taking water are charged a paltry $3.71 per million litres used. This is not a typo. Ontario must stop allowing big companies to rip off the province's water. It is bad enough that the government allows multinational companies to privatize a public resource, it is even worse that taxpayers are being hosed by charging so little for it. Several industries get a total free ride when it comes to taking our water, an explosive new report from Ontario's Environment Commissioner revealed. 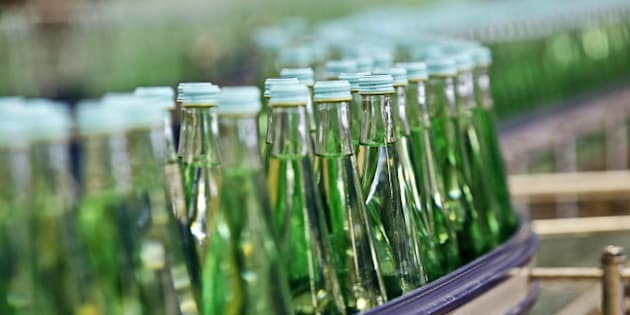 Those who do pay for taking water -- "phase one" industrial and commercial users that include bottled water producers; vegetable and fruit canning facilities; and certain types of chemical manufacturers -- are charged a paltry $3.71 per million litres used. This nominal fee works out to less than $10 for enough water to fill an Olympic-sized swimming pool. That works out to $0.00000371 per litre. After the ECO report I walked down to the basement in Queen's Park to double check that a 500ml bottle of water was still selling for $2. That's right, you can buy a litre of bottled water at Queen's Park for more than it costs a company to take 1 million litres of our water. This absurd system enables the provincial government to recover only 1.2 per cent of the money it spends on water quantity management programs. Since the Ministry of Environment and Climate Change (MOECC) receives less money today than it did in 1992, the budget it has for water management is not enough to make it an effective steward of our water resources. Yet, the province is essentially giving away our water. To make matters worse, industrial water users such as nuclear power stations; the iron and steel industry; golf courses; and many other industries pay no fee to take water. Not only does this result in underfunding of programs that manage and protect our water resources, it also provides no incentive for companies to use water responsibly. In 2003, Dalton McGuinty's Liberals promised to bring in a water taking fee. The MOECC began charging a small fee in 2009. That fee has not changed even though the ECO advised the government at the time that the fee was inadequate. It was too low to create incentives for water conservation, and it would not provide cost recovery for water management programs. For years, under pressure from the Green Party and others, the Liberals have promised to raise the fee. Even the 2012 Drummond Commission Report -- in which the Liberals mandated its focus be limited to cutting spending -- recommended increasing Ontario's water-taking fee to provide full cost recovery. And the 2012 Liberal budget said the government would take steps to recover the costs of environmental programs and services, including water-taking. Yet, the Liberal government has failed to act. Meanwhile, the government's flawed Permit To Take Water (PTTW) process threatens the quantity and quality of Ontario's water. The ECO report is especially critical of the lack of transparency and accountability in the PTTW process. Many high-risk uses of water receive little or no public scrutiny. The ECO concludes "that increasing water demand from a growing population is reducing the baseline water flows for some streams and rivers." The Grand River watershed, where Nestle is applying to take even more water for its bottling operations, is particularly stressed by low water levels, according to the ECO. Yet, it took a legal challenge by community and environmental groups to restrict Nestle's water-taking in Wellington County during drought conditions. The MOECC is also being challenged by the largest municipality in Wellington County for an amended water-taking permit issued to a quarry operation that is adjacent to wells producing 25 per cent of Guelph's drinking water. The City of Guelph is asking for conditions that protect the quality and quantity of the city's drinking water. The MOECC has failed to resolve the matter even after pressure from all political parties. All people should have the right to clean drinking water. It is clear that the province desperately needs to overhaul its PTTW process to prioritize water-taking for public drinking water and for growing local food. And the Liberals need to stop dragging their feet on charging water-taking fees that provide full cost recovery for water protection and management services. We must act now before the well runs dry.